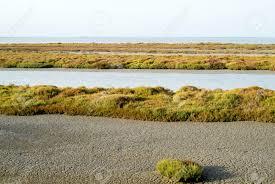 If you are a true committed nature lover, venture into the inner sanctuary of the Camargue, the Reserve nationale de La Camargue. This very intensely protected area contains the central pond called Le Vaccares, mostly used for scientific research. 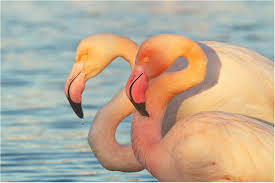 The wildlife- birds and fish – is naturally undisturbed here, and you won’t come across the cabins and herds of bulls and horses that most people expect from the Camargue. 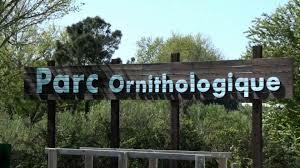 When you arrive you can pick up maps and information at the center of information of the natural Parc of La Camargue (04-90-97-70-82), April through September., daily 10-6 and October through March, Saturday through Thursday 9:30 – 5. To explore this area you will have to go by foot, bicycle or bike paths.Also you won’t be able to diverge from marked trails. 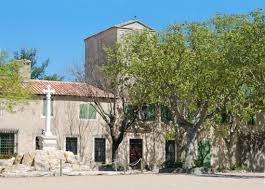 If you keep going north you will come across the converted sheep -ranch – now museum, Le Musee Camarguais ( Mas du Pont de Rousty, D570. April through September, daily 9:15 – 5:45, October-March daily 9:15-5:45. Lying between Arles and Saintes Maries de La Mer, it explains the region history, produce and people, also a good place to get information on nature trails. Near the northern shores of Vaccares, one of the larger ranches in the Camargue has been turned into a show place of all things Taurine. Bullfights, ferrades, horse rides, and spectacle taurine ( bull- baiting) are some of the activities offered at the domaine de Mejanes Paul Ricard. People learn about the history of the unique regional species of bull-fighting, the Cours Camarguaise, in which bulls are not killed in the arena but simply taunted by runners, who try to pluck off a red cockade and two white tassels mounted on the bull’s horns. http://www.mejanes.camargue.fr . At the easternmost point of the Etang du Vaccares, another good visitor center is found at La Capeliere. 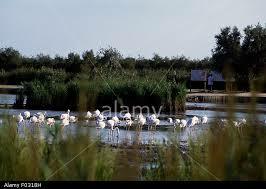 Center of information of la Reserve National de Camargue. The center has maps, exhibits on wildlife and three sentiers de decouverte ( Discovery trails, 3 ml south of Villeneuvel Romieu. As you drive through the few roads that crisscross the Camargue, you will usually be within the boundaries of the Camargue, http://www.parc-camargue.fr. Unlike many state and national parks in the US, this area is privately owned and utilized within the rules imposed by the state. The principal owners are the ranchers ( Manadiers), with the help of their gardians keep it for grazing their wide-horned bulls and their broad-bellies white horses. Some claim that the Moors imported and Arab strain and is prized for its solid endurance. The curved horned bull may have been imported by Atila the Hun. 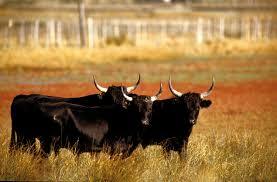 If not participating in a bloodless bullfight or may end up in the wine-rich regional stew ( beware! 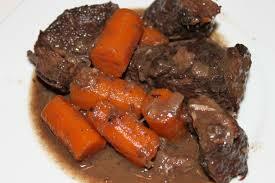 ), the stew is called la gardianne de taureau. 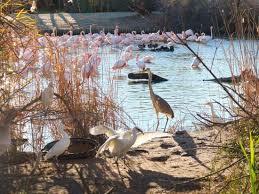 Wild Camargue and the birds. Deep in the heart of Provence? 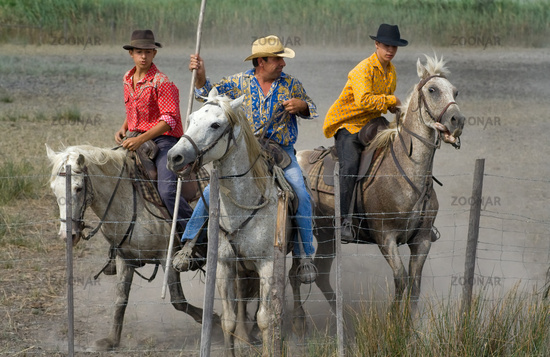 While the thought might give a pause to some of Texas residents, historians now tell us the the American cowboy is actually descended from the French gardian, the Provencal cowboy. Horace Greeley who wrote ” go West”, advised that in the early 19th century, these Camargue ranchers did exactly that:shipping out to the French colony of New Orleans, then they spread out across America as the first horse-wranglers. They brought along their black felt hats, string ties, and to the later gratification of Levi-Strauss – bleus de travail or jeans invented in the Provencal city of Nimes. Their festival wear: including traditional velvet vests- seen in full glory during the Fete des Gardians in Arles in May- inspired a local resident and now designer Christian Lacroix. Today Les Gardians are a unique breed, proud of their centuries old traditions and disdainful of the Hollywood cowboy poseur. Insular and taciturn they love to kid you when they first meet you, if you take offense they will kid you even more and if you don’t take offense, they will warm up to you.